I'm a great lover of courgettes - courgette and dolce latte soup in particular but I am forever being teased about the number times I offer up a medley of creamy courgettes and mushrooms when left to my own devices in the kitchen. Last year Thomas bought some courgette seeds at our local garden centre and we were amazed to find that nothing grew better in our wee vegetable patch than these courgettes. We had so many we even had to give some away. We decided to become more adventurous. 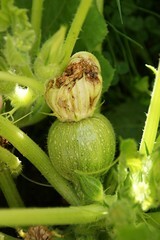 We bought Tuscan courgette seeds in Italy last summer for planting out this year. I mentally prepared many courgette recipes. The plants currently take up a quarter of our vegetable patch so we should be eating courgettes with every meal BUT I am more than disappointed with our little Italian impostors. These plants put all their energy into growing huge yellow flowers which despite being edible and fairly flavoursome are a poor substitute for real courgettes. Worse still they offer up very few tiny spherical courgettes which are protected by large cactus-like spikes. The first time I picked one my thumb throbbed and bled for two days. Although these are delicious, there are so few I feel like our whole vegetable patch has spent the entire summer creating a mere half dozen vegetables. And I never expected to be savaged by a member of my beloved courgette family. All I was going to rant about this time is the fact that they are shutting down their Århus and Billund routes (supposedly only till about May, but we'll see). Of course the problem with that is that Thomas's parents tend to come and see us from Jutland in the winter and now they're going to have to swim! They can still come in the summer from Jutland, or they could if they didn't live in Italy in the summer! 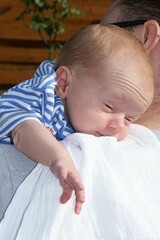 And I don't suppose quite as many of Thomas's friends will be dropping by with their kids either if they have to walk! Thanks again Ryanair. 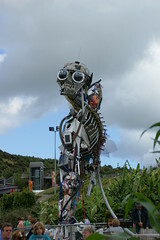 While in Devon we drove over to Cornwall for a day to visit the famous Eden project. I knew it was a made up of several greenhouse domes containing tropical plants and landscapes but knew little else about it. You arrive above the site so the view is quite spectacular. Léon did make me laugh by commenting that his Pumpa would enjoy playing golf with such impressive golf balls! You walk down to the domes through some beautiful gardens teeming with flowers of all sorts. As you reach the bottom you bump into this robot sculpture made up supposedly from the equivalent of all the electronic gadgets an average UK citizen throws out in a lifetime. Being a bit of an environmentalist place, this is of course meant to shock you and make you think. But given many people take their kids on day trips to Eden, this completely backfires. Léon, as any typical four year old, took one look at it, proclaimed it the coolest robot he'd ever seen and asked if we could gather old hoovers to make one of our own! Every other small boy within earshot was having the same misguided conversation with his family! I had to laugh. Once inside the actual domes, the size was impressive enough but they were eerily silent inside. I couldn't put my finger on what was wrong until Thomas pointed out there were no animals, insects, lizards, snakes, butterflies, birds or any of the many things I had expected to see given I'd visited Denmark's Randers regnskov (which is a mini-Eden but full of life) a few years ago. Eden even used plastic fruit in several of their stands inside which was completely unnecessary given what could be grown there. All in all it was pretty enough, but I was much more impressed with the outside gardens than those inside the domes. They do a special summer price whereby visitors arriving after 15h30 only pay £10 per adult and kids get in free as opposed the the extortionate morning prices. I was happy to have paid only £20 for all seven of us to visit because it wasn't worth more. Given a choice at some future date between revisiting Eden or Randers I'd opt for Randers every time. I've been having missing sock problems all my parenting life. I remember ranting about them in my very first blog postings. I counted nearly forty single socks today - I have been bagging them for years assuming the missing ones would turn up immediately if I gave up and threw them out. Surprisingly we only had one morning of rain on our sixteen day tour of the UK. 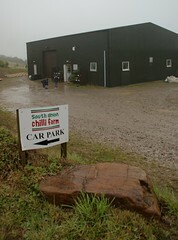 We decided to spend it looking for South Devon Chilli Farm after seeing its address on the back of a jar in the campsite shop. It wasn't far and offered free tastes of most of their products (from sauces to jams to chocolate bars) and a chance to see a good number of varieties of chilli grown in their poly tunnels. I'd thoroughly recommend an hour here if you're stuck in the rain in Devon! I had to laugh this morning watching the 90 or so new primary ones running into school. What do some of the parents think their kids are going to be doing in school for the next year? 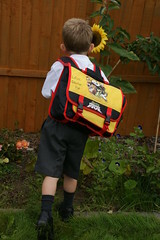 Some of them had on schoolbags so big they actually couldn't keep their balance. One child actually needed his teacher to walk beside him holding the bag by the handle at the top as he was unable to stand at all! Some of the poor wee souls could have gone camping in their bags! Many waddled with huge overpacked bags knocking heavily on their coccyx. What was wrong with reading the instructions parents received back in May? We were advised to buy a small bag just big enough for one A4 folder and a pencil case. Twenty years from now the whole of Newton Mearns is going to be full of small adults whose growth was stunted by overzealous parents in their early childhood! My little baby Pudgeman started school today! I can't believe he's old enough for primary school already. 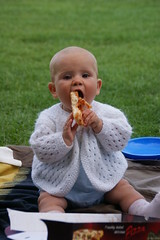 I'm not even sure he is, given his attempts at getting his clothes on the right way round! 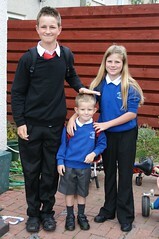 He just looks so tiny beside his brother who's in S2 and his sister who's in p6. He was a little tired looking but was first of nearly ninety kids to run into the school line-up, so I figure he felt both confident and happy. Now I have until 3pm to worry he's getting on ok! Gordy was round to play with Pudge yesterday. It was a perfect summer's day so garden time was on the menu. After showing him our sunflowers and teaching him which berries in the garden were edible, he and Léon had what looked like the best half hour of their lives jumping into the paddling pool with handfuls of freshly cut grass, shouting that they were playing in courgette soup! The grins were so big, they almost met round the backs of their heads! Thomas did walk by at one point and mutter - they seem to be enjoying their last day of freedom - with both of them starting primary school today, I guess yesterday was their last completely carefree day until they reach retirement which by the time they are old will probably be about 65 years from now! 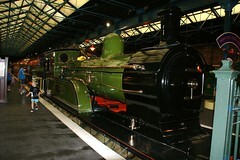 A piece of advice for anyone with kids within a couple of hours of York: take them to the free National Railway Museum there - it is just amazing - Léon ran around for hours from train to train just thrilled to see them all! It's definitely a good, cheap day out! It's funny what you find out at the ripe old age of 42. I have always known that I was not meant to be called Phyllis. When my parents got pregnant in May 1967, they informed my four grandparents that no child would be named in any way after them: Jean, Matthew, Phyllis or William. Of course things shifted slightly when my fifty year old grandmother was diagnosed in the September with a terminal illness - it shifted to a remote possibility at that point. And I assume if she'd lived till March or April of 1968, my life would have been very different. But as it was she died on the Tuesday before I was born (on the Sunday). My Phyllis/non-Phyllis status was, I always assumed, sealed at that moment. But during dinner with my parents on Friday, I was told for the first time in my life that I actually wore name tags for my entire stay at the maternity hospital sporting the name Linda Buchanan! In 2007 I had to pay to change my name by deed poll because my divorce was not going to be through in time for me to give Anna my surname. 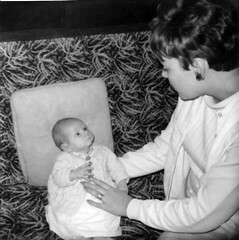 It was strange to hold in my hand a piece of paper with a blank box asking me to fill in what I wanted to be called - changing to Phyllis Buchanan cost the same as it would have cost to give myself a whole new first name and middle name (something I'd always resented not having, given my brother had one). I still disliked Phyllis but I couldn't choose anything else because you don't name yourself. The only people who could have changed my name by deed poll to something else were my parents, so I found myself ironically paying not to change first name or add a middle name - odd... I don't really like it, but it is me all the same. It is funny how many other people that has affected too. My younger brother was given the middle name Henderson to pacify my mum's mother who had been upset that I'd been given my dad's mum's name and only this week my new nephew was named Henderson too to carry on that tradition. I wonder what Derek and Alasdair's middle names would have been had they had a sister or auntie named Linda instead of Phyllis? 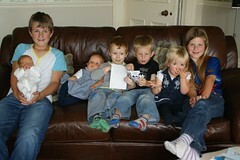 So now there are seven of them - grandchildren of my two only-child parents. They didn't see that coming! Dad has decided to refer to them as his dynasty! But is this only the beginning? Maybe there will be 29 great grandchildren! As part of our ambitious camping trip (a 2000 mile trip round the UK with all five kids in a car without a roof box or trailer!) we stayed in a city camp site in the East end of London. The site itself was a green oasis in the middle of urban London surrounded by an electric fence that made us wonder where we were! I have camped all my childhood and most of my adult life. I have never had any problems camping. You can leave things in your tent because you know no one will ever enter your tent. A tent is sacred to other campers. So given the electric fence I was more than surprised when I returned home the first day and found a few things had been moved. Having no valuables in the tent, I just carried on as always. 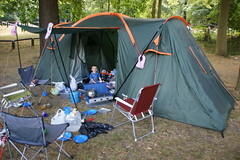 The second day I returned to find crunchy nut cornflakes had been emptied all over the living room of my tent and someone had broken the box of dried baby food. Is this what happens when you camp in a big city? I had camped in Nice and Florence before without any issues. I was puzzled. On the third night it suddenly dawned on me who had been invading my tent... the shredded Tesco bags were the giveaway. Bloody urban squirrels! We're camping in Paignton this week. This morning we noticed we were just 12 miles from the famous Buckfast Abbey. We drove across Dartmoor to what seemed like a fairly civilised little abbey. We had a lovely lunch and walk through the lavender fields. As we went to leave it occurred to both Thomas and I that neither of us had ever tasted their tonic wine. Thomas bought the smallest bottle they had. After dinner he poured us each a bottle top full. I am now utterly puzzled as to how anyone can get drunk on the stuff given even a tea spoonful is so sweet and syrupy you can't stomach it! It tastes a bit like the vile ginger wine my old Granda's girlfriend - the scay 80-something Greta - used to give us at xmas as teenagers. We all jostled for the seat closest to the plantpot so we could dispose of it quietly! Anyone who can manage a whole glass of Buckfast must have a stomach of iron. When we admitted to Marcel we'd never tasted it he looked shocked and said he had... strange - I thought I was paying for an overpriced house in Newton Mearns to stop him from becoming a Buckie ned. But when I asked where he'd tasted it, he said they had served it at several of the Bar Mitzvahs he'd been to recently! Newton Mearns after all! Phew!